An Appreciation to Tracey from your colleagues at Dundalk FM. We will miss your weekly 100% Irish show on Dundalk FM, it encouraged presenters to play some of the artists they heard on your show and your presentation style and the content of the show was as professional as you are likely to hear on any radio station. I hope that you got plenty of satisfaction from the series. I would like to thank you and Tray for the marvelous publicity you brought the guests and by extension to the station. So after all that, I hope you will continue to send in once off festival 100% Irish shows – they are really great shows. You broke a lot of new ground by recording the show at home and emailing it in, sending us the ‘One to Watch’ and the once off Vantastival and Knockanstocken Festival shows. That is in addition to presenting First Cut, hosting the Battle of the Bands in the Imperial Hotel and joining the LIVE CREW at Vantastial 2018. 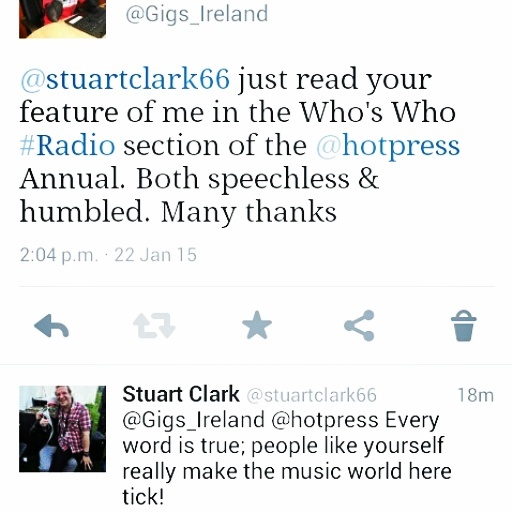 There will always be a slot on Dundalk FM for your next radio idea. Once, again thank you for wonderful Irish music that you have curated for the education of our listeners. 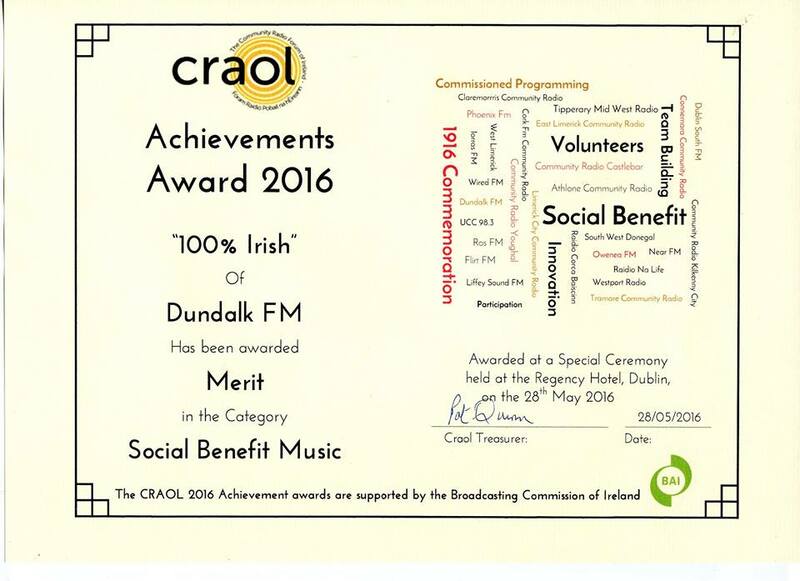 Congratulations to the 100% show – winner of a Craol Music Award held at the Regency Hotel 0n May 28th 2016. Tracey Hanby is one of Ireland’s best known Irish Music promoters. The 100% Irish Show is a National Chart of the top Irish tunes. The judges said the show was ‘innovative, well produced, stylish and, above all else, 100% Irish!’ Tracy chooses an upcoming tune called ‘One to Watch’ which is featured on Dundalk FM each day of the week. 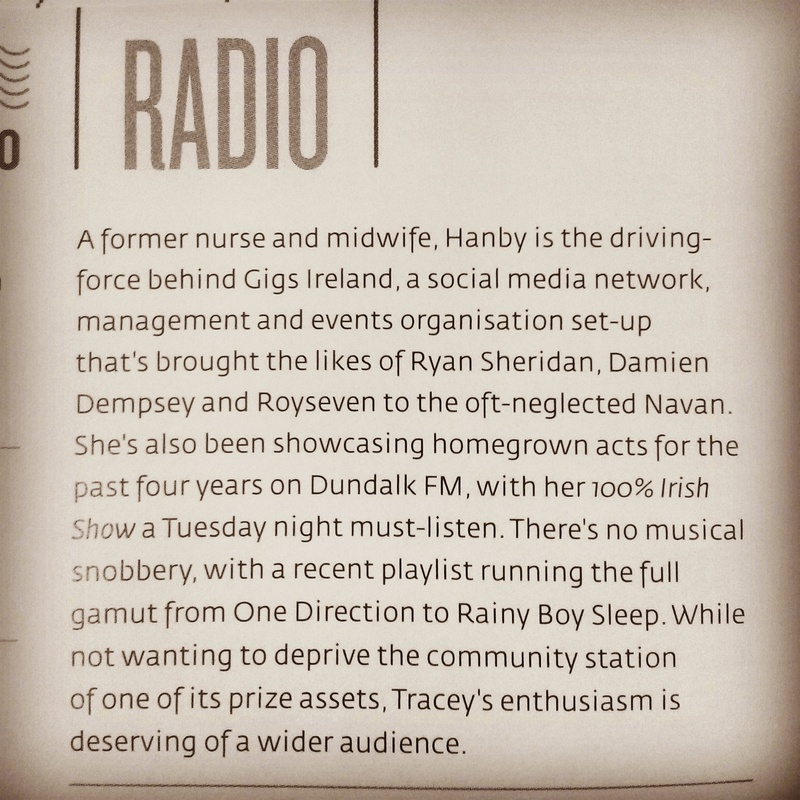 Dundalk FM 100% Irish, the National Chart Show is hosted by Tracey Hanby of Gigs Ireland and is on every Wednesday at 9pm and Saturday at 10pm on Dundalk FM or via Tunein App for online listeners. The show has been up & running since 2014 and has a growing listnership tuning in to hear a national chart featuring Irish artists charted using IRMA, ITunes, Spotify, Shazam & other charts programmes. 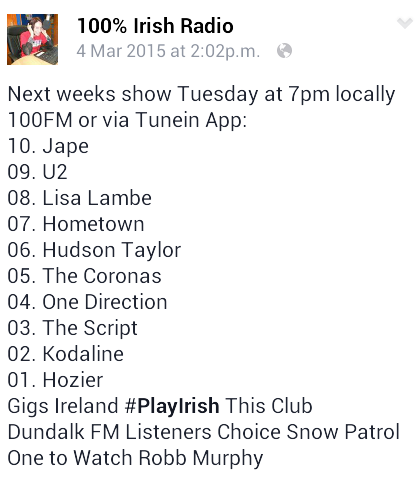 The ‘One to Watch’ closes the show and is featured on other shows throughout the week on Dundalk FM so well worth submitting for.